A couple of weeks ago i tidied my dressing table. It's normally a right mess, bobby pins (or Kirby grips) and powdered makeup dust everywhere. 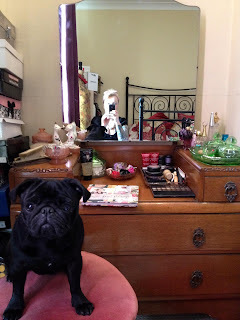 I even got round to cleaning all my makeup brushes and containers, this happens about once a year i am ashamed to say, don't judge me Ms Moo (a dear makeup artist friend of mine, check out her work)... i also don't take my makeup off before i go to be either, heheehehe. Anyway despite it being covered in crap my dressing table is rather pretty and i have some rather pretty vintage pieces on it too. My uranium glass dressing table set, should house my bobby pins and pin curl clips, but these can usually be found scattered across the house on the floor, its good to keep them always hand i say. But my other half's opinion slightly differs. I drive him insane with my general messiness and bobby pins and in particular dress making pins forever on the carpet! 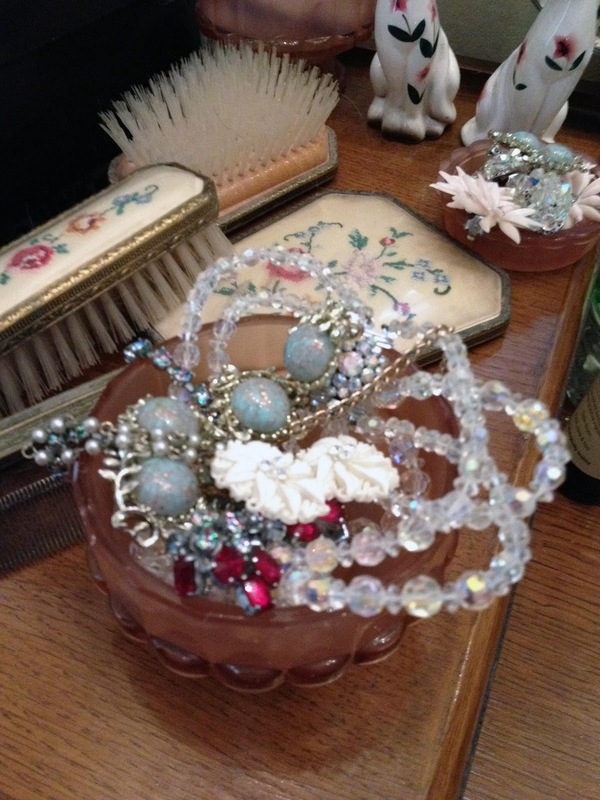 I need to find a more particle way to store my vintage jewelry. 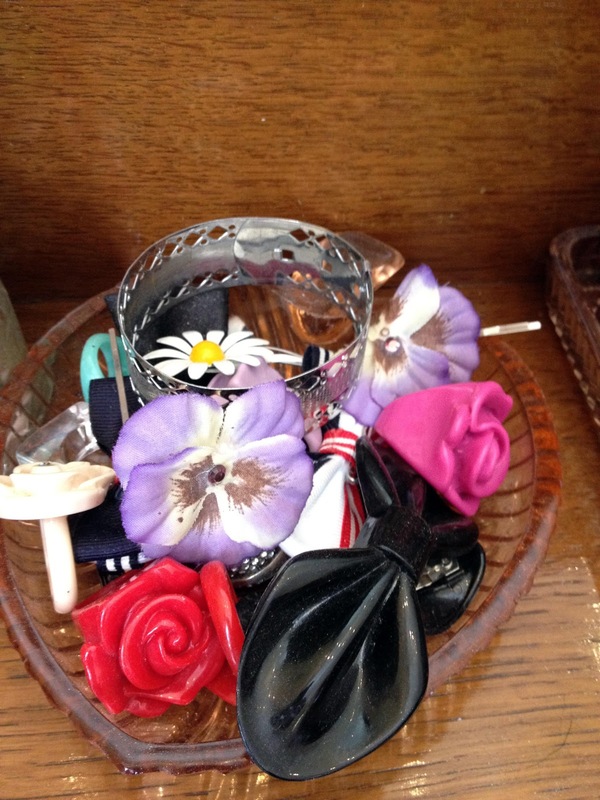 In this photo my favourite pieces are in this little glass pot, but more often than not they can be found on my bedside table, by the edge of the bath, on the coffee table, in various handbags. 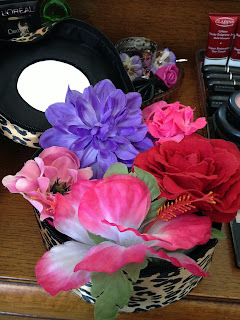 Making getting accessorised when one is in a rush a nightmare... and i am always in a rush and running late. My flowers and my headscarfs 'should' live in these boxes, which are shelved on a rather ugly modern book case in the corner of my room, this is also where all my bags live. 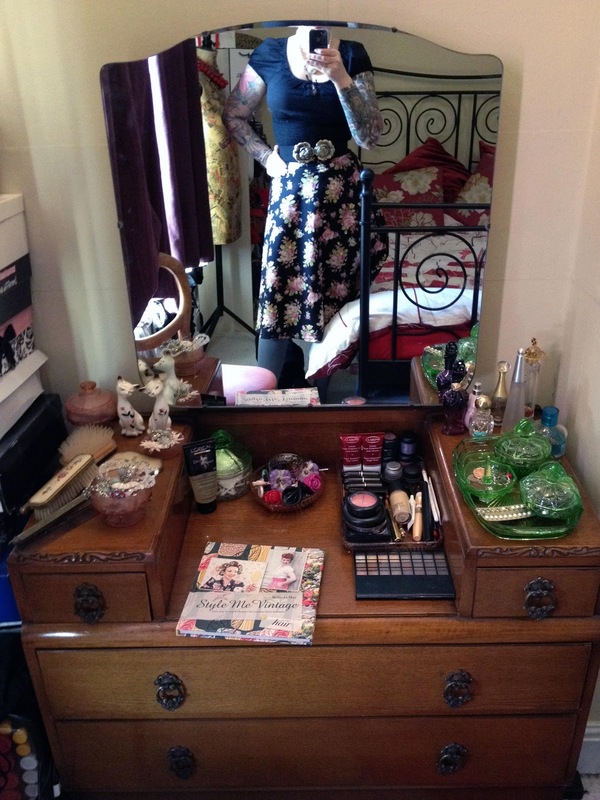 No photos as i am ashamed to have such an ugly piece of furniture in my bedroom! This is my makeup, not a big collection. 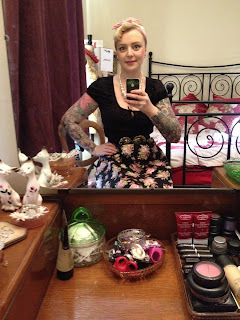 I usually wear the pin up, vintage look. Its all about a smooth clear base, Rosy cheeks, simple eyes, liner and red lippy of course. I love lipstick. My collection consists of just two brands MAC and Rockalily. Also have a Chanel one but that's gone to the junk makeup box along with MAC Ruby Woo, as its rubbish! And a token goof ball photo of me in the mirror! 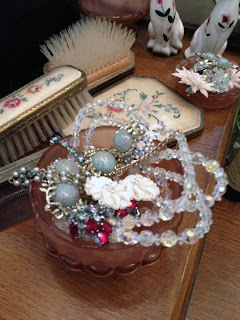 I keep my vintage jewelery in embroidery floss/tackle boxes. I have one for brooches, one for earrings and one for necklaces. They are semi-transparent so you know what's in them. 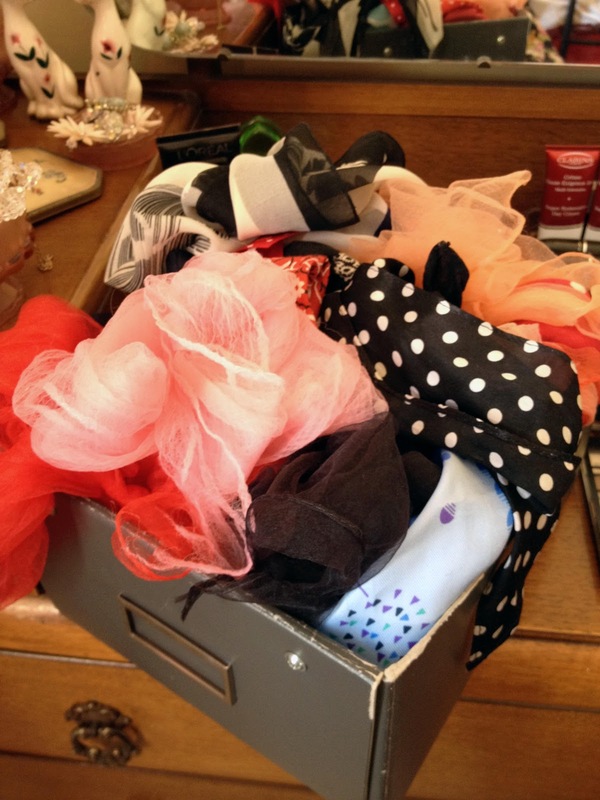 The only downside is that they are not glamorous looking at all, but I just deal with it by leaving them in a drawer in my own dressing table. 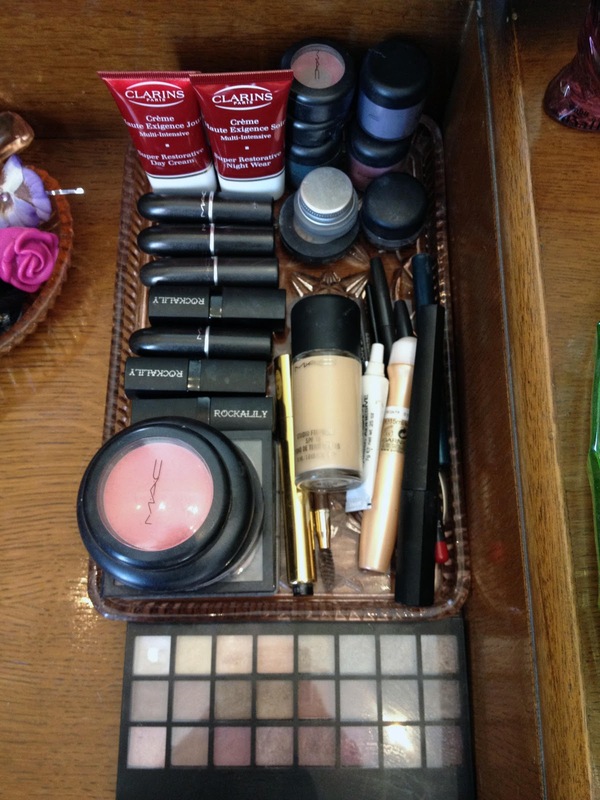 So pretty and organised. 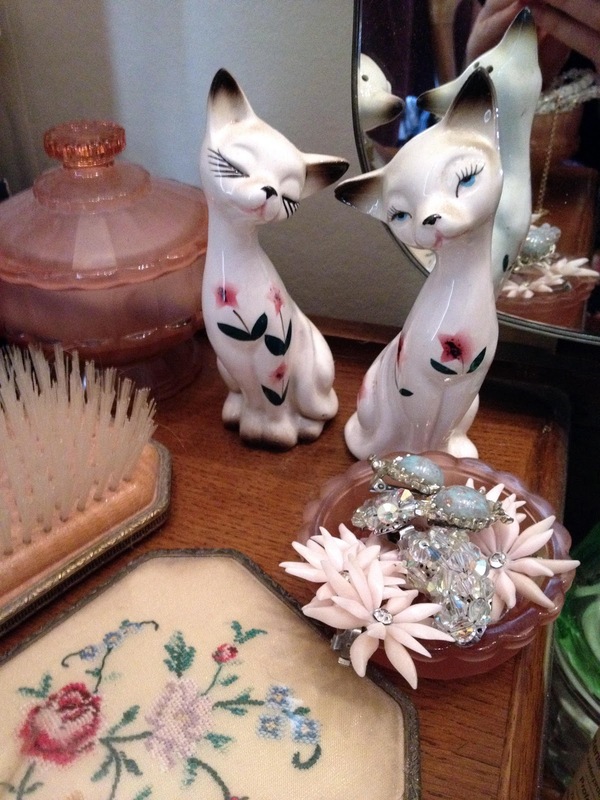 I have a siamese cat on mine too - I must get it a friend. 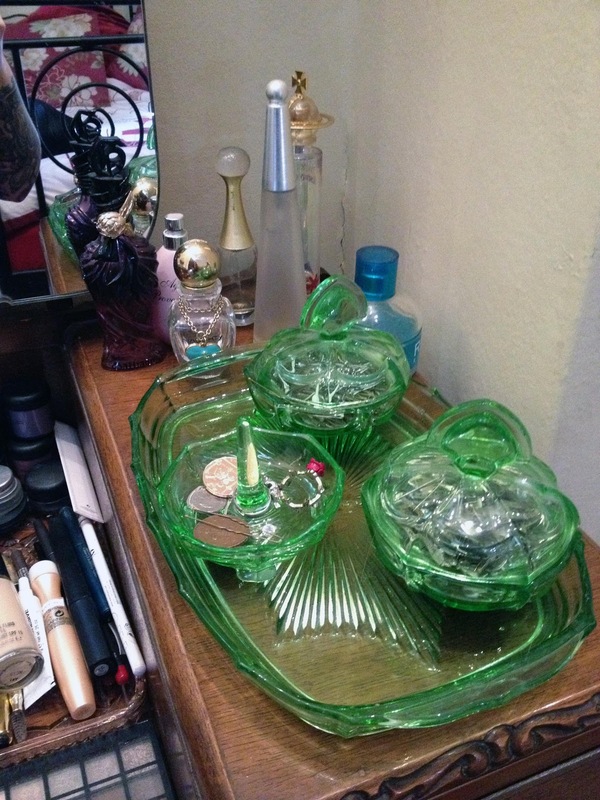 Love the uranium glass set - isn't it amazing stuff! 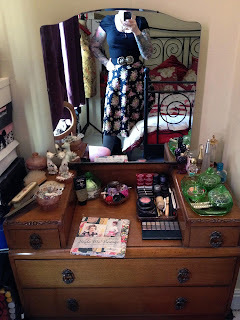 I am going to clean my dressing table up after work now- it's almost disappeared under scarfs and vintage mags. I love how neat and tidy your dressing table is. Mine is a MESS. I am also envious of all your Rockalilly lippys! It's quite neat to see the different designs, we got TONS of vanities at work and they are all grand, if you see Swedish ones from the same era they are quite minimalistic and clean in their design (and often in teak, like mine). You just encouraged me to tidy mine up as well.